With 81% of travellers regarding a comfortable bed as “the single-most important factor” for an enjoyable stay in a hotel room, it’s imperative to ensure the bedding, mattress and bed linen you offer is carefully thought out. Though choosing the best bed linen for your bed & breakfast, holiday home or hotel is an essential process, it can also be a difficult one when weighing up the pros and cons of every style, colour, fabric and thread count available. 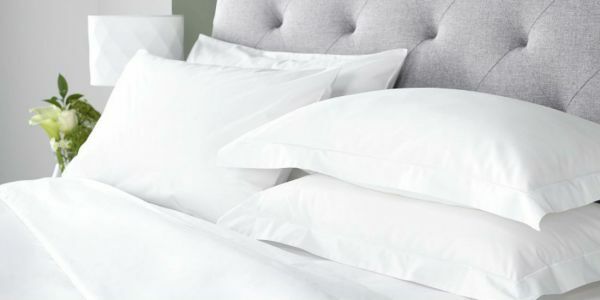 From polycotton vs cotton to choosing the right thread count, this extensive bed linen guide contains everything you need to know about choosing the right linen for you and your guests, so you can perfect that essential great sleep environment. 1. What is a thread count? The thread count of bed linen refers to the number of threads woven together per square inch, counting horizontal and vertical threads. Say, for instance, 100 lengthwise threads are woven with 80 widthwise threads, this would produce a thread count of 180. Does a high thread count mean quality? A higher thread count is desirable in hotels as it is often associated with being softer, stronger and more luxurious than other bed linen. 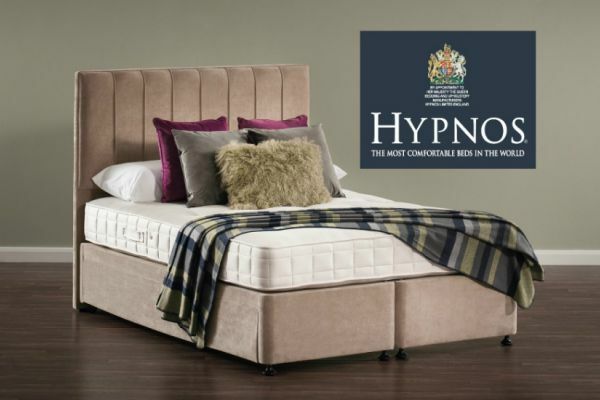 The misconception, however, is that a high thread count is completely synonymous with quality, as quality can also be heavily determined by the standard of the fabric itself. 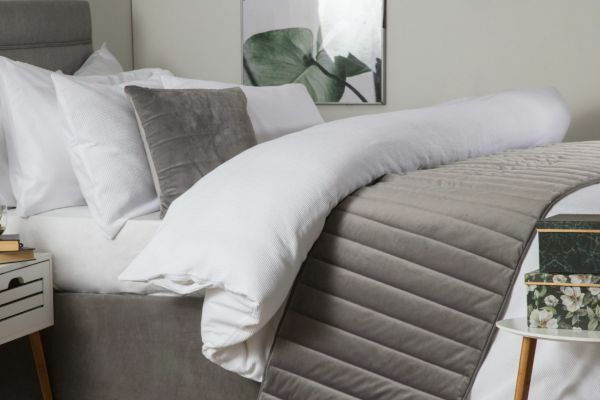 Our luxurious 400 thread count bed linen, for example, is produced from 100% fine cotton, giving a silky soft finish that is highly sought after in boutique hotels and B&Bs. While the thread count is a huge factor in the overall standard of a product, its combination with a superior fabric is what allows the quality to really shine through. Linen with a higher thread count can also translate to a much higher price tag, so ensuring you consider, but are not driven by, the thread count of a bed linen is essential when weighing up the benefits of style and fabric, too. Often confused as a type of fabric, percale refers to a specific type of weave consisting of a simple criss-cross pattern, used to create a durable yet soft fabric, tightly woven to ensure it is suitable for repeat use, washing and drying. Authentic percale linen is defined as having a minimum of 180 threads per square inch, resulting in a superior finish. Percale is not, therefore, defined by the fabric it is produced from, meaning it can be manufactured using polycotton, 100% cotton, or any other blend of fabric threads. 2. Polycotton vs. Cotton: Which is better? 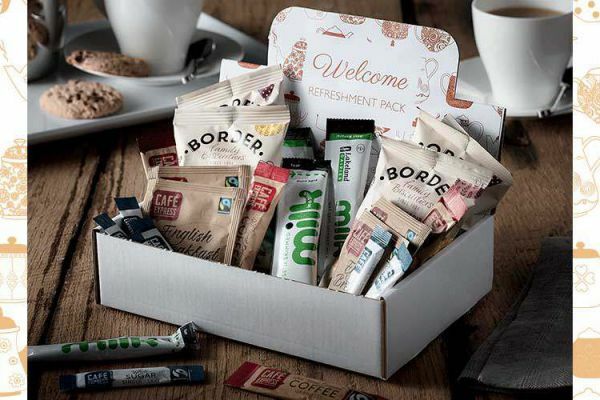 Both polycotton and cotton remain the top two choices amongst hotels, B&Bs and self-catering properties for two entirely different reasons. Polycotton, a blend of durable polyester and luxurious cotton, is a preferable choice due to being relatively easy-care, meaning little to no ironing is necessary to still maintain a crisp finish. The fabric is also renowned for being incredibly long-lasting, withstanding the rigours of repeated use, washing and drying, serving as a great choice within commercial environments. On the other hand, polycotton linen also has a reputation for having a rougher feel compared to cotton, largely due to the fabric containing the manmade synthetic fibre, polyester. To combat this, however, our Expressions range contains combed cotton to retain the desirable silky soft finish while maintaining the advantage of being an easy-care fabric. The combing process removes all unwanted fibres from the cloth so the yarn is more even and, as a result, smooth to the touch. Cotton, on the other hand, is often a popular choice due to the element of luxury it adds and the benefits that follow. 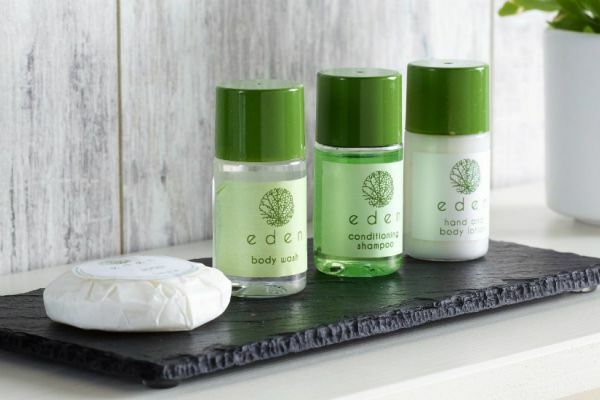 Rather than being combined with a synthetic, man-made fibre like polyester, 100% cotton linen utilises a naturally occurring material, making it a great choice for guests with sensitive skin. It is also favoured due to its ability to retain its softness, breathability and durability wash after wash due to the exceptional natural properties of the fabric. On the other hand, cotton also has a reputation for being relatively high maintenance in terms of washing, drying and ironing time compared to polycotton. Ironing time, however, can easily be combatted with the use of a blanca laundry press, which will significantly reduce your ironing time, while giving the finish of a professional launder. Due to variances in fabric and style, our bed linen ranges vary in size, though they are typically the same, or slightly more generous in size, compared to the standard UK bed linen sizes. As cotton has a tendency for shrinkage when washing, we try and accommodate this specifically in our sizing. You can find measurements for our bestselling collections below, though all products will contain the specifications you require on our website. 4. Plain, patterned or colour? Not only is bed linen a practical necessity in every bedroom, it can also serve as a decorative addition to tie into any room décor. Whether opting for plain or patterned bed linen in your bedrooms, it’s important to assess what fits best with your décor and, most importantly, what your guests will like. Crisp, white linen is a timeless favourite amongst most hosts and guests alike, as it gives a sense of freshness and minimalism that’s sure to please everyone. Though plain in appearance, less is often more with bedroom décor, and white linen can be livened up with pops of colour by adding soft furnishings such as runners, cushions and curtains. If you fancy a change from traditionally plain bed linen, patterned bed linen can serve as a great statement piece. When done right, geometric patterned bed linen can really add a modern touch to your rooms, or if opting for a floral print, subtle patterns can be a great alternative to plain bedding without being too garish. If all you want to add is a little bit of texture to your bed linen, ruched or seersucker styles are certainly the way to go. Coloured bed linen, especially in pastel shades such as duck egg and minimal silver greys, are incredibly versatile and on-trend. 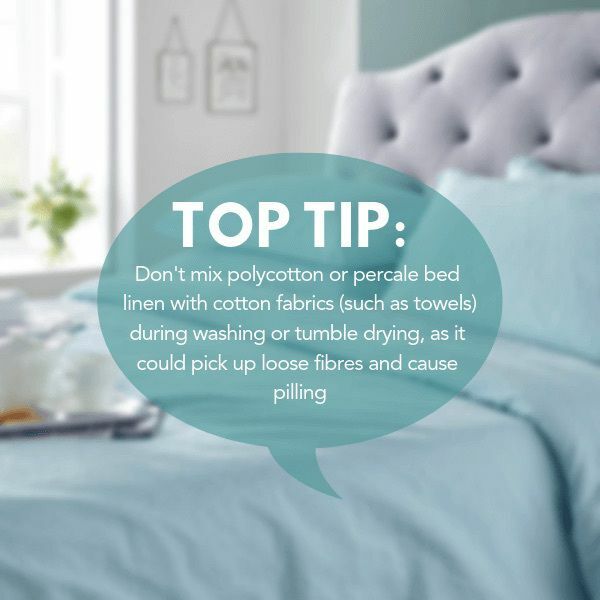 The stainless steel poppers on our bed linen are not compatible with the laundering process of calendering, which involves forcing fabric through two heated rollers at high pressure to smooth out the linen. Do not over-dry and use a cool down period allowing the cloths, and walls of the machine to cool completely before stopping the tumble drier. This will minimise creasing. We appreciate that bed linen within a hospitality environment has to withstand far more rigours than that of domestic bedding. 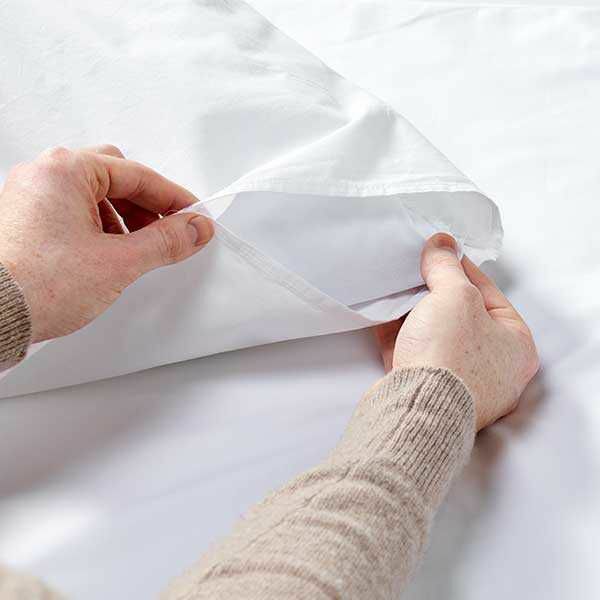 That's why all of our bed linen is made to last ensuring colour and quality are maintained, and we’ve added a number of extra features to save you time and effort when changeovers are tight. Our standard bed linen ranges all feature stainless steel poppers that are not only durable, but also make a considerable difference in speeding up changeovers. Our Percale and Expressions collections also contain colour coded size identification tabs, allowing you to quickly and efficiently select the correct size duvet cover without rooting through your entire linen cupboard. Our standard 200, 300 and 400 100% cotton duvet covers, as well as some of our patterned collections including Portishead, Elizabeth and Emily, are specially manufactured with a wide shoulder feature to ensure changing the duvet cover is effortless and time-saving. Bed linen terminology can be a confusing and even mind-boggling task to decipher, so take a look at our jargon buster below to get savvy with bed linen slang! Percale: A closely woven plain weave fabric. This can be 50/50 polycotton, 100% cotton or a blend of any other fabrics. A thread count of 180 or higher is usually considered percale. Pillowcase: Often co-ordinated with duvet covers, pillowcases are a hygienic casing for your pillows to protect against bodily oils, sweat and soiling. Pillow protector: Used as a barrier between the pillow and pillow case, pillow protectors are popular additions to guest rooms as they protect pillows from fluids, oils and stains making contact with the pillow, helping to extend the lifetime of the pillow. Thread count: This refers to how many threads – vertically and horizontally – are woven into one square inch of fabric.